I’m going to purchase a license for either Espresso or TextMate and so I’m going to use each for their full trial period, then decide. 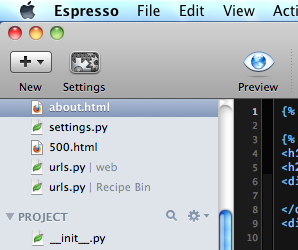 Right now I’m using Espresso, I’ve been pretty happy with it so far. Notice the last two open files, they’re both named “urls.py”. This follows naming conventions in Django. But can cause problems in most editors where all you see is the name. Espresso was smart enough to recognize what was happening and tack on the name of the folder so I can see which file I’m working on. So sweet! Nice work!